DETROIT – While at a gathering during our week-long test drive of the 2017 Volvo S90, a friend commented that he didn’t know that Volvo made cars like that. The “that” meant full size luxury sedans of the first order. Volvo’s new flagship reminded us of what a designer said years ago about automotive luxury. It’s conveyed in the interior of a car and Volvo certainly did that with the S90. Like Scandinavian design which is a minimalist philosophy, inside the Volvo S90 was awash in what the automaker called natural open pore walnut which was used as a design feature rather than because that’s what you do, use a dollop of wood to justify cost. It conveyed an air of luxury. The perforated leather of the seats, the front pair was heated and cooled while the back seats were heated, aided in conveying sumptuousness. Volvo has one of the best seat designs in the industry with safety being the prominent theme but the S90’s seats accentuated the luxurious ambience of the car too. Working its way across Volvo’s new 90 series was the vertical 9.3-inch vertical touchscreen. It employed infrared sensors which meat it would work when wearing gloves. The screen had the feel of a smartphone meaning command channels and selections slide across the screen or up and down it with the flick of a finger and selections were made with a tap on the screen. Volvo went with a full digital instrument display. It was 12.3 inches wide, it was adaptable and it could and did show navigation, media, speed information and the gauge cluster. It would post the speed then let us know by flashing the speed limit icon a few times when we exceeded it. There was also a red line on the speedometer to double the warning. And the speed limit sign in the heads-up-display would flash a few times too. No way could we not know when we were speeding in the S90. The car had three different ways of communicating information to the driver. Important and crucial safety information was displayed in the TFT screen via the heads-up display or the digital driver display. Information and commands that could be taken care of at the driver’s discretion were displayed in the 9-inch Touchscreen in the dash. For instance, the car would calculate the speed and the distance from the vehicle ahead and would flash a warning icon if we were following too close to safely stop. Anyway, the 2017 Volvo S90 had a 19-speaker premium audio system which is very important in the luxury segment. The sound quality was excellent. The car’s grille looked upright but it was slightly concaved inward with Volvo’s iconic iron mark badge in the center. And Volvo’s famed shoulder was there too but it was concaved and offset. Thus, it didn’t look bulky or give the car a boxy appearance. It ran the length of the car. Our S90 had LED headlights featuring Volvo’s Thor’s Hammer design DRLs; it had short overhangs, a long nose and short rump, that high shoulder line and a long dash to axle ratio. That would be the distance from the top of the dashboard to the axle. It meant the height of the front side of the car. Certainly, the 2017 Volvo S90 is a product of the automaker’s technical skill. The luxury sedan was built on the Volvo’s scalable platform which will be used for all future Volvos. And it had a direct injected 2.0 cylinder gasoline engine that variations of which will also be used in all Volvos to come. This version of the engine had a supercharger and a turbocharger. It made 316 horsepower and 295 pound-feet of torque. It was mated to an eight-speed automatic transmission. The EPA rating was 22 mpg in the city, 31 mpg on the highway and 25 mpg combined. The 2017 Volvo S90 all-wheel-drive was super quick because of the low speed oomph of the supercharger. The sedan handled with rifle-shot accuracy. And because it was so quick, the S90 had sure gripping brakes. It had 18 and 17-inch disc fore and aft respectively. Of course it had a drive mode that adjusted transmission, steering, brakes, stability setting as well as stop/start function. There was plenty of feel in the steering; it was power assisted rack and pinion. Selectable drive modes were comfort, dynamic, eco and individual mode where the driver can tailor individual driver elements to his or her liking. This mode can be stored to the remote control FOB and sets up once the door is unlocked. There was an in-car hot-spot which meant the S90 could audio stream using either Wi-Fi or Bluetooth. Of course there were voice controls, USB and auxiliary jacks, satellite radio, and a navigation system. Volvo branded its infotainment system Sensus Connect and some of the apps were HERE Local Search, TuneIn, Pandora, Spotify, Glympse, Local Search, Yelp, Weather and Wiki Locations. In addition, customers can download new apps like Exchange Mail notifications, Facebook Messenger or Stitcher as soon as they become available. The Apple iPhone app made it possible to connect an iPhone 5 and up. Consumers and enthusiasts have been waiting, sometimes not so patiently, for Volvo to resurrect itself. 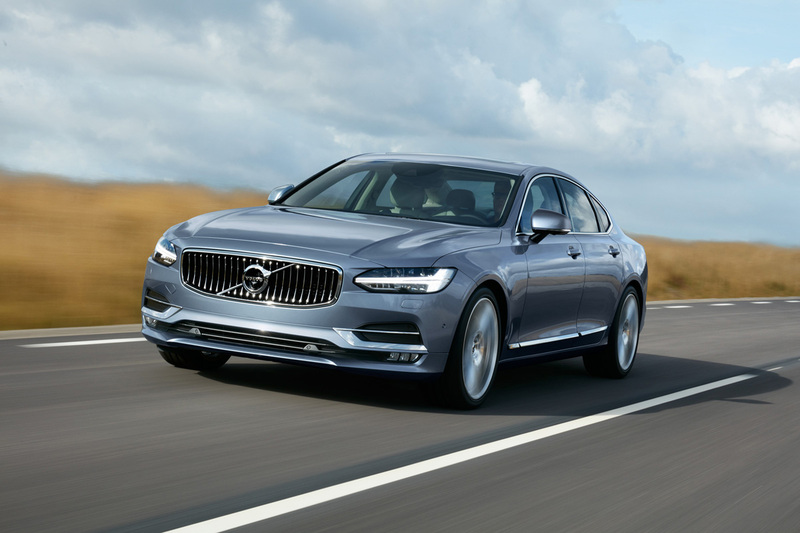 The 2017 Volvo S90 is yet another step in its comeback. The price of our test car was $66,365.